Spread over three floors, the open plan kitchen overlooks the lounge, and also offers a large terrace complete with outdoor seating. 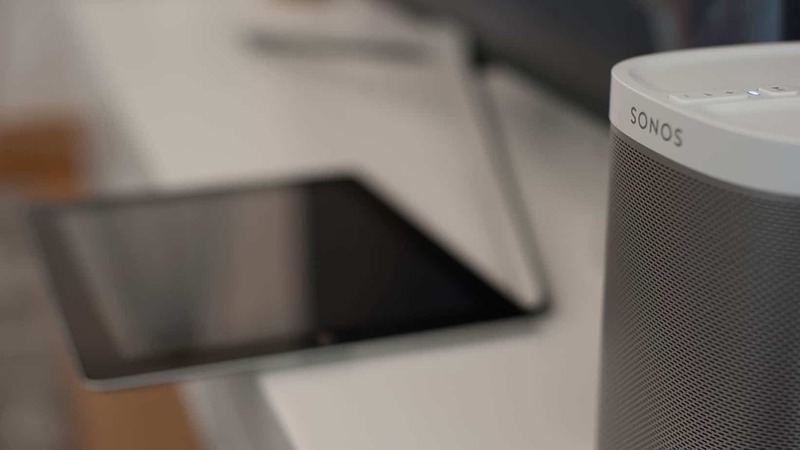 The SONOS system is a great perk for when you are making the most of the fully equipped kitchen and cooking up a storm. 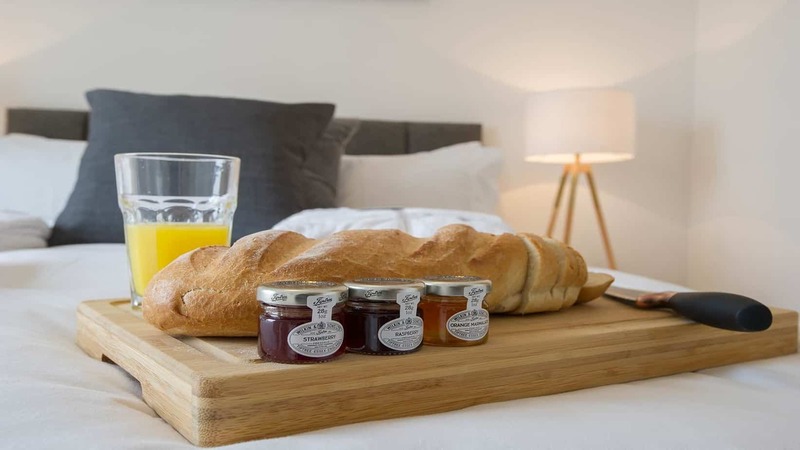 Don’t worry about getting the ‘essentials’ prior – our complimentary welcome hamper has all you shall need to get started. In the lounge you can curl up on the sofa watching the complimentary Netflix on the smart TV or enjoy a Nespresso coffee whilst flicking through the days news on the iPad. 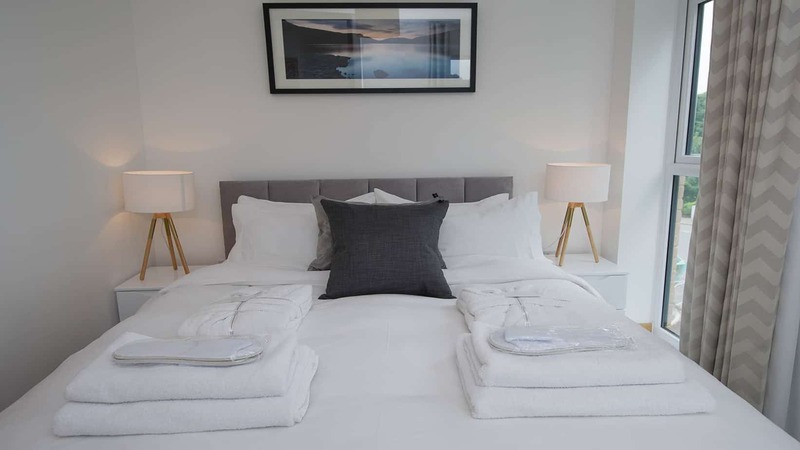 The two spacious bedrooms each offer their own en-suite bathroom, so feel free to make use of the complimentary Aromatherapy toiletries, slippers and robe after enjoying the benefits of a rainforest shower. You can then snuggle down in the 300 thread count egyptian cotton bedding and enjoy a soundless nights sleep. There is plenty of storage for your luggage so you don’t need to worry about space. You will also have use of a private underground parking space. Street parking is available for additional vehicles should it be required. 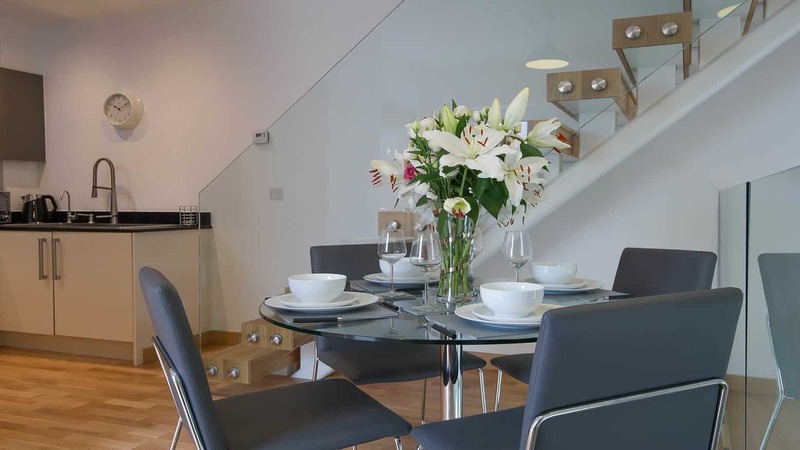 Tailored Stays executive Townhouse enjoys easy access to excellent transport links. Cambridge Railway Station is under a mile from Grand Central, with direct trains running every 20 minutes, or less, to London Liverpool Street as well as frequent direct trains to London King’s Cross, (these fantastic links offer connections to the London Underground and all that the capital has to offer in under an hour). 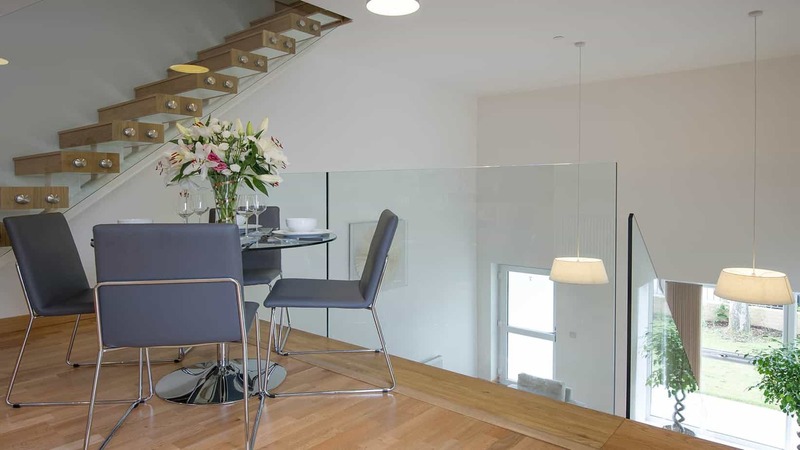 The Townhouse is also perfectly located for shopping within Cambridge with grand arcade shopping centre and the historic city centre just minutes from your door. "The bedrooms offer the finest night sleep, with Egyptian cotton bedding, duck down pillows, and lots of light creating welcoming space." 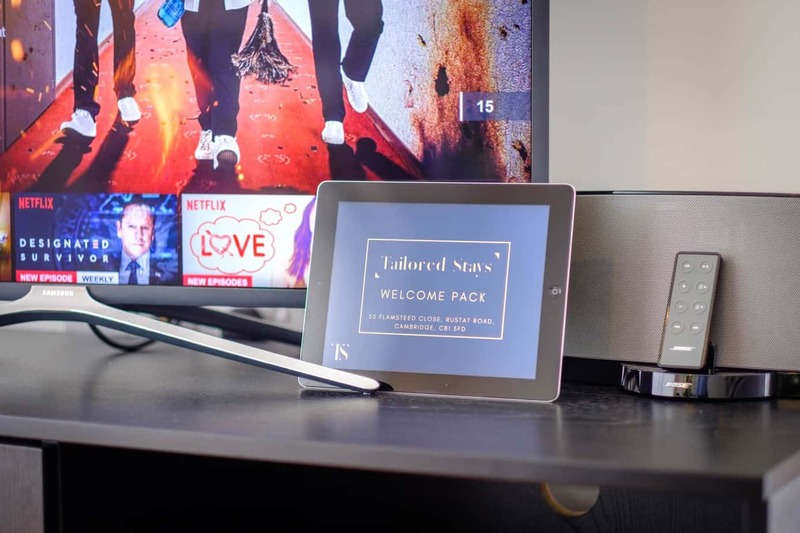 The apartment offers a 43 inch smart TV with complimentary Netflix and use of iPad for those nights in. 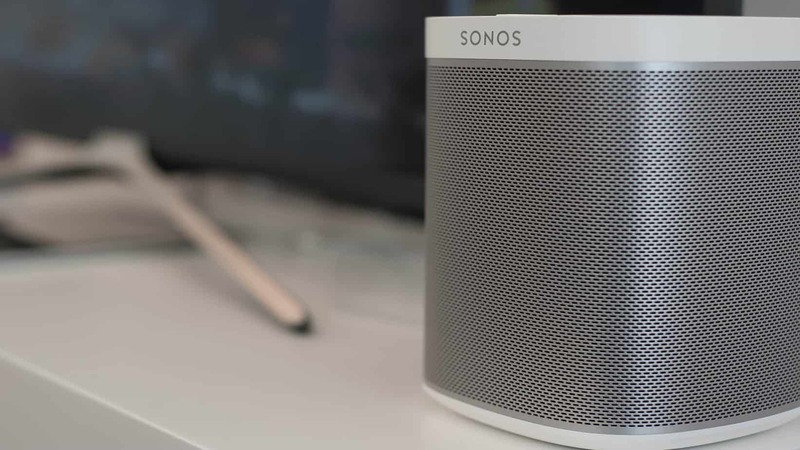 The living room enjoys a SONOS sound system with complimentary Spotify to enjoy all your favourite music. 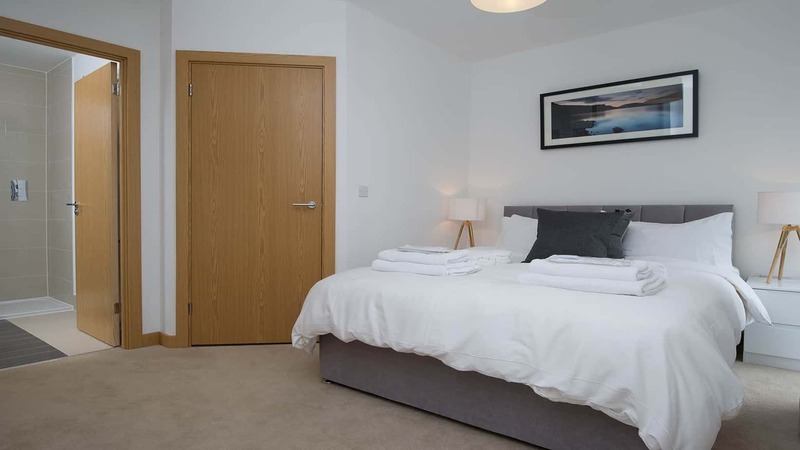 Furnished with modern, contemporary furnishings, you’ll not be disappointed with what the Executive Townhouse has to offer. 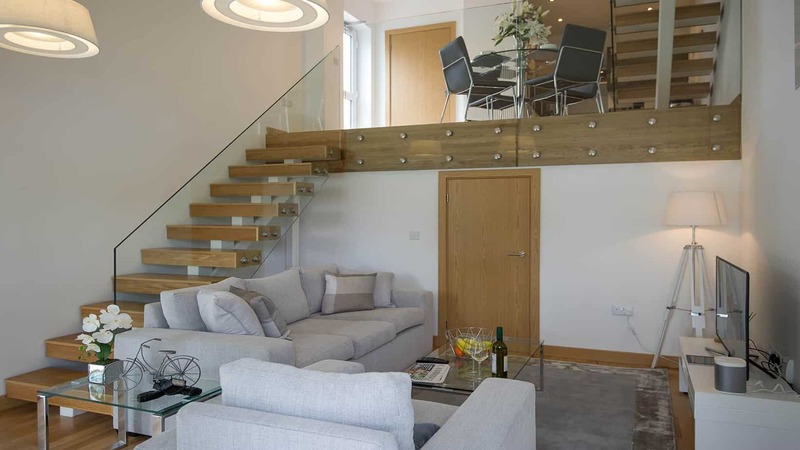 This triplex apartment spread over three floors and offers a large 1,000 sq ft of living accommodation with private terrace. 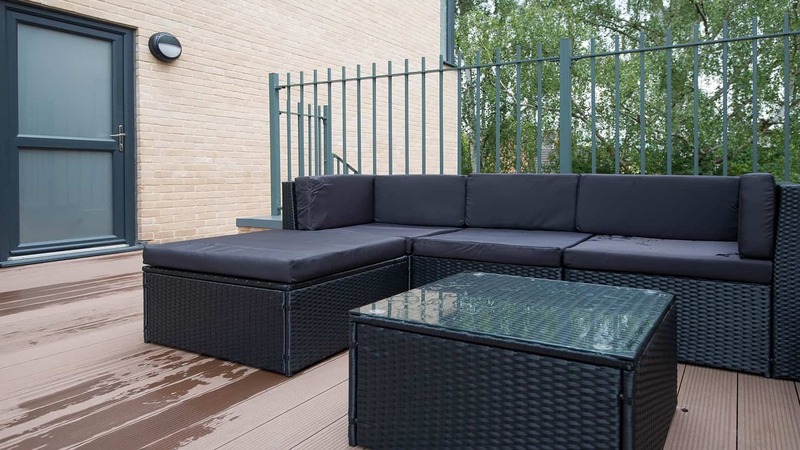 "this impressive Townhouse benefits from a large terrace complete with an outdoor seating area."  Tailored Stays takes it’s responsibility in providing each guests the very best stay during their time in Cambridge which is why we are proud to be the highest rated serviced apartment provider in Cambridge. INTERESTED IN EXPERIENCING THE EXECUTIVE TOWNHOUSE?